At this year's Nürburgring 24-Hour endurance race, Toyota plans to unveil a flashy convertible hybrid that's nimble and - are you ready for this? - cranks out 295 horsepower Yep, that's right, a sporty Toyota hybrid! Co-developed by Gazoo Racing, the Toyota GRMN Hybrid Concept II is a revised version of the Toyota MR2 Sports Hybrid concept unveiled at the 2010 Tokyo Auto Salon. With its mid-mounted gasoline engine and all-wheel-drive system, the GRMN Hybrid should be exceptionally well balanced and more than capable of getting all of them 295 horses (245 hp from the V6 engine and 50 hp added by the electric motor) to the ground. The sub-3,300 pound GRMN Hybrid reportedly scoots from 0 to 60 miles per hour in the mid-four-second range. Automotive News (sub. req.) says that "Toyota is coy about production plans - it will watch fan reaction before making any decisions." We say, don't bet on the GRMN Hybrid showing up on dealer lots in the near future but if it does, go ahead and ask for a test drive. 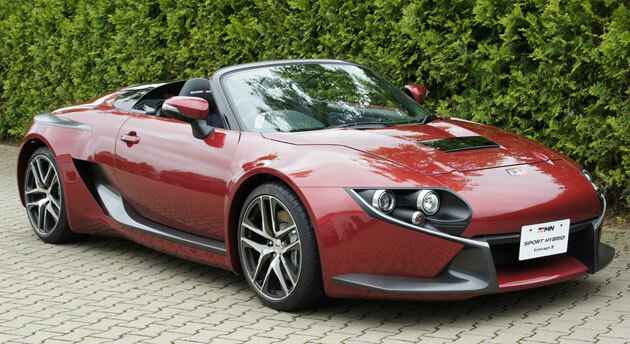 GRMN Concept II is one sporty Toyota hybrid originally appeared on Autoblog Green on Fri, 24 Jun 2011 16:55:00 EST. Please see our terms for use of feeds.